Recently, one of my friends asked if I could make a matching Demi purse for her Gypsy. She loved the size and style of the purse she already had, but there was one problem--it didn't match her other giraffe Cozies. So, I looked at the pictures and measurements she supplied and this is what I came up with. The inside is fully lined and has 4 or 8 pockets--depending on what you want. As you can see, the pockets are the perfect size for Cricut booklets/cartridges, scissors, markers, etc. The bottom is just right for your Gypsy. This is a close-up shot of the quilting around the top. The quilting on the bottom part of this purse is stippled. The handles contain interfacing, making them retain their shape a little better than fabric alone. The binding along the top has been hand-stitched. The approximate dimensions of this purse are 11" x 9" x 5"--perfect for your favorite 8 1/2" x 11" scrappin' paper. These are so much fun to make! And...they are also the perfect size for lots of different cell phones and iPod Touches, too! They are totally customizable with any fabric and/or embellishment you would like. I can even adjust the width of the flap. These Mini-Cozies stay securely closed with a Velcro closure. They would also work well for Gypsy/E2 styli, small cameras, gift cards, and cosmetics. The Hottest Fashion Trend of the Summer! Recently three of my new friends decided to design/choose a set of Cozies to coordinate their craft room and protect their prized machines. While the three sets of Cozies are totally different, they are each so beautiful and well thought out by the wonderful ladies who ordered them. Which one is your favorite? Kymberlee chose this exquisite Michael Miller fabric from fabric.com. I decided to add a narrow pink band to give the two fabrics a little more contrast. This is an Imagine Cozy. A pretty crocheted flower and button finishes off this E2 Cozy perfectly. Laura decided to talk a walk on the wild side and go with a giraffe print--but...with a multi-color touch! She chose the raspberry pink, teal and lime colors. But then she asked me to surprise her with the coordinating colors for the Cuttlebug Cozy and scrap bag. (Oh, the pressure!!) I thought bright purple and yellow would complete the set...plus, I was running out of colors! These Cozies, which were a birthday present for Laura, are seen here in their new home. Thanks for the pic, Laura! And last, but definitely not least, is this set for Tangee. Shown in this photo are Cozies for the new Cuttlebug, E2, and Expression. Some custom covers are piled in the back, and a cute little scrap bag finishes off her set. 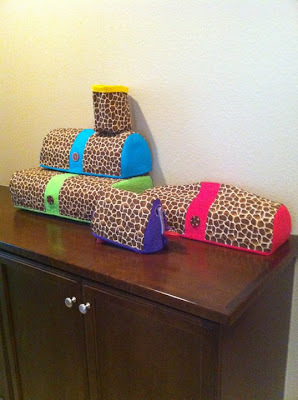 What's incredible is that these Cozies are going to match the wallpaper on Tangee's blog. How cute is that!!? ?